Designer Kids Clothes - Worth the High Price? Designer Kids Clothes – Worth the High Price? Oh, how times have changed. When I was a kid, I was happy with my Garanimals and a secondhand tape player. Today, it’s all about brand-name labels and personal MP3 players. Kids definitely have more material goods at their disposal today than in past years. 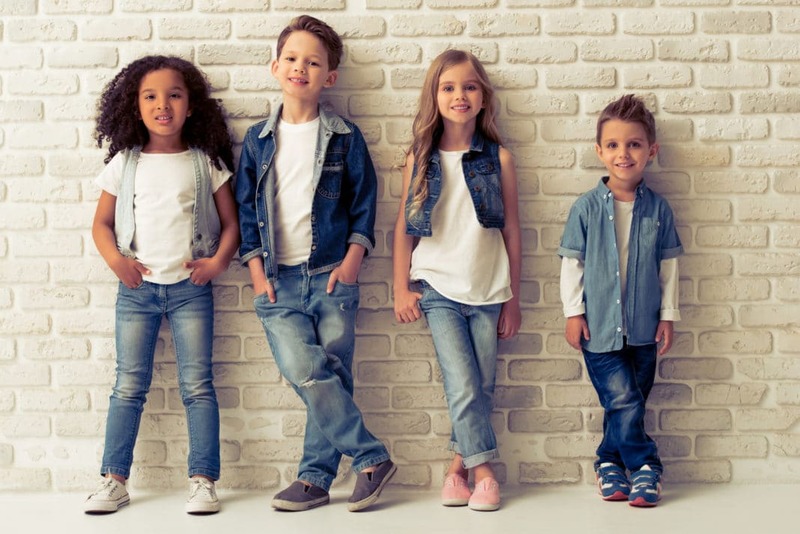 The constant pressure to fit in at school and to “keep up with the Joneses” could have you searching for pricier duds for your child to make sure that she or he fits in. A handful of high-end designers have started offering small versions of their most famous clothes, offering kids lines that definitely do not offer kids prices. Instead, you have to pay a premium price to have your child rock the threads of Marc Jacobs, Stella McCartney, and Gucci. So, what’s a parent to do? Save money on kids’ clothes by sticking with lower-priced stuff, or give in to the cries of a fashionista tween? It’s definitely something worth thinking about, especially since buying or not buying designer threads sets a precedent for your family. One of the first things you must take into consideration is whether or not designer kids clothes are really worth the hefty price tag. A tank top from Baby Dior can cost as much as $248 – are you willing to pay that much? A couple factors go into the decision-making process. Quality. As much as it pains me to say it, designer clothes are definitely of superior quality when compared to the mass-produced stuff you find at Walmart. That’s because designers tend to use better, more durable fabrics, with high-end components like real silk, rhinestones, and even fur to amp up the high-fashion factor. As far as workmanship, detail, and quality, you definitely get the best when grabbing designer clothes. Of course, that’s not the only factor, but it’s something to consider. Longevity. Of course, your kids’ designer duds could last until Armageddon, but it won’t mean much when your kids are growing every day. Unless your child wears out clothes at an incredibly fast rate, you’ll probably never get to test the theory that designer clothes last longer than cheaper outfits. That’s one of the biggest drawbacks to buying designer clothes for kids. While you could invest in a pair of shoes and wear them for years, your growing child probably only has six months to a year before moving on to the next size. High Style. If you’re a stickler for fashion, it’s understandable if you want your kids to be a reflection of your own style aesthetic. Loading your kids up with flashy labels could be a point of pride for you, especially if you’re totally obsessed with fashion. If you’re a fan of Marc Jacobs, Juicy Couture, and Armani, you’re probably more prone to reaching out for the same designers for your child. It’s true that higher-end designers probably whip up the coolest kids’ clothes, so if that’s a priority for you, you can snag high style by paying more. While you definitely pay more for a label and the quality of the clothes, most parents know that kids’ clothes take a beating, and therefore spend less on kids’ clothes than they spend on their own stuff. But what if your child is old enough to know the difference between The Children’s Place and Ralph Lauren? Designer clothes become more of a priority for teens and tweens, especially when friends and other peers are wearing name-brand jeans. As a parent, you’re probably still funding shopping trips – but you no longer make all the decisions about your older child’s wardrobe. If your teen is begging you for a D&G sweater, it can help to find reasonable ways to make it happen. Pay for Services Rendered. If your child asks for some pricey designer clothes, link up a shopping trip to allowance and chores around the house. This is the perfect time to teach your child about budget priorities and working hard to achieve a goal. If your child wants a $100 jacket, add up chores around the house and count up how many weeks of allowance it would take to save up. Seeing the options on paper may even have your teen or tween searching for a less expensive option. Gift It. There’s nothing wrong with gifting a designer skirt or pair of jeans to your child come birthday time. Just be sure he or she understands that receiving the designer duds is a treat, not a common occurrence. You can also talk about caring for pricier pieces to make sure you get the most wear out of an expensive designer wardrobe. Check Out Flash Sales. Designer clothes usually mean big spending, but you can score them on the cheap by registering with flash sale sites like Ideeli, Gilt, and HauteLook. While flash sale sites are typically for adult couture, they regularly features sales specifically for designer kids’ clothes at a huge discount. By joining a flash sale site, you get notifications when a sale starts, usually lasting 12 to 24 hours. With deep discounts, you can give your picky child brand-name clothes without brand-name prices. Find a Happy Medium. Perhaps your child turns up his or her nose at big box store clothes, but that doesn’t mean designer is your only other option. Look for a happy medium so your child feels confident in the clothes you pick, and you feel confident that your bank account isn’t totally drained. Head to the mall together to find a brand that you can both agree on, whether it’s GAP, Aeropostale, Justice, or another store. This allows you to pay lower prices, while your older child can still choose trendy outfits for school to fit in with friends. Ultimately, your parenting philosophy, personal style, and overall budget will dictate whether or not designer kids’ clothes are worth the price. The truth is, if it’s something that’s important to you and you can afford it, go right ahead. But if keeping your child in Gucci garb is putting you in the poorhouse, it’s definitely not worth the cost. Do you think designer kids clothes are worth the price tag? What are your favorite children’s clothes brands?